Maryland state delegate Emmett C. Burns Jr. probably had quite a weekend. 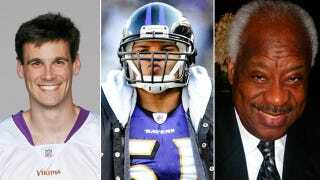 After Baltimore Ravens linebacker Brendon Ayanbadejo expressed his support for Maryland's upcoming ballot initiative to legalize gay marriage, Burns wrote a letter to Ravens owner Steve Bisciotti that basically said football players who disagree with Burns should know their place and keep quiet. That, of course, drew this reply from Minnesota Vikings punter Chris Kluwe. "Upon reflection, he has his First Amendment rights. And I have my First Amendment rights. … Each of us has the right to speak our opinions. The football player and I have a right to speak our minds." His advocacy used to lead to "snickers in the locker room" and a jokes that he is gay (he is not).